Oakland Raiders head coach Hue Jackson set in stone that Jason Campbell is number one quarterback to lead them back in contention. With not much talent behind Campbell, the Raiders required some kind of insurance policy to back him up. Therefore, the Raiders Saturday signed veteran quarterback Trent Edwards. Last season they were bless to have quarterback Bruce Gradkowski, who recently signed with the Cincinnati Bengals to aid with their young rookie talent Andy Dalton. Additionally the Raiders were unable to move up in the draft and grab a young quarterback they had their eyes set on Colin Kapernick, now with the San Francisco 49ers. So why not grab a guy who needs a new start himself? Edwards last season was his worst in his career, he truly never seemed to find a place or his touch. But don’t spare away from Edwards he is still young and in 2007 made to the NFL All Rookie Team. 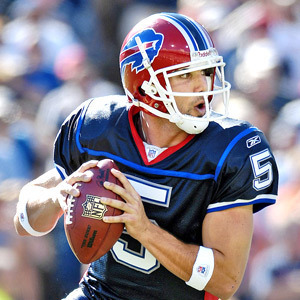 Edwards’s best season of career came in 2008 with Bills he started 14 games as the quarterback and threw for 2,688 yards with 245 completions and eleven touchdown passes. He is not a star quarterback by any means but he can provide the team with good back-up plan when required. With the right coaching from head coach Hue Jackson and staff Edwards can get his game back on track and his number called once again. Expect, Edwards to take over where Bruce Gradkowski left off for the Raiders last year but have more experience as a starter.